Finally, the PS Vita gets a little more love. Atelier Shallie Plus: Alchemists of the Dusk Sea is getting a Western PS Vita release as of January 17, 2017. 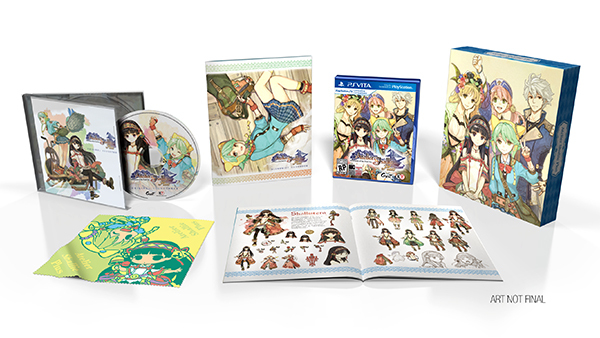 That's great news for fans of the Atelier series, because the special edition it's getting looks pretty impressive, actually. The game will be made as both a physical and digital edition in North America and Europe, with a special limited edition from NIS America that will be sold exclusively in its online store. "In this game, the player will assume the role of Shallistera and Shallotte, who are alchemists seeking to solve the issues within their village and city. Shallistera is the daughter of the ship family’s leader. She is in searches for a means to save her home village from a severe drought and travels to the main town to seek help and assistance. Shallotte on the other hand is a novice alchemist who is taking on odd partime jobs at the main town. She ends up meeting Shallistera by accident and agrees to help her solve the drought issue. There are also additional story chapters that goes deeper into Shallies daily life and also the mysteries behind the dusk, a phenomenon that is causing the worldwide drought. Also the new story chapters introduces new characters like Ayesha, Keithgrif, Escha, and Logy. There are also additional dungeons to explore and new enemy bosses to battle." If you've never played any of the games from the Atelier series, this is going to be an excellent starting point, so keep an eye for it when it finally makes its debut.